It's dinosaur week here at Little Weirdos! (please note I am not a big enough geek to have planned it that way prior to starting to write this post. OK, I am probably that big of a geek, but I still didn't plan it that way). Actually, getting a set of Dinosaur in My Pocket figures last week prompted me to dig out some of my other dino mono mini figures and take a group shot. How many toy lines can you name that are shown in the photo? For a cheat sheet, highlight the text at the bottom of this post. I should point out that there are a few that are kind of unknown to me, specifically the light pink Apatosaurus, gray Triceratops in front, and light green guy near the back right (not brushed up on my dino knowledge enough to know what he is). But I am pretty sure I got those three when I was really little at K-Mart, of all places, in the kids meals they used to offer in their store cafes (why do I remember these things?). I'm not sure whether those sculpts originated from some other line. Dino Brites, Neclos Fortress, Dinosaur in My Pocket, Jurassic Park dinosaur egg candy toy premiums, Transmutazors, Schöller Dinosaurier. The light pink Apatosaurus and gray Triceratops were from the same set, which also included Tyrannosaurs, Dimetrodon, Parasaurolophus, and a pterosaur, I think it was a Rhamphorhynchus. I can almost picture a Stegosaurus bubbling up in my memory as well, but I'm not sure. I got all of these in a bag at a convenience store I think, back in probably the early '90s. Mine all came in bright primary colors. 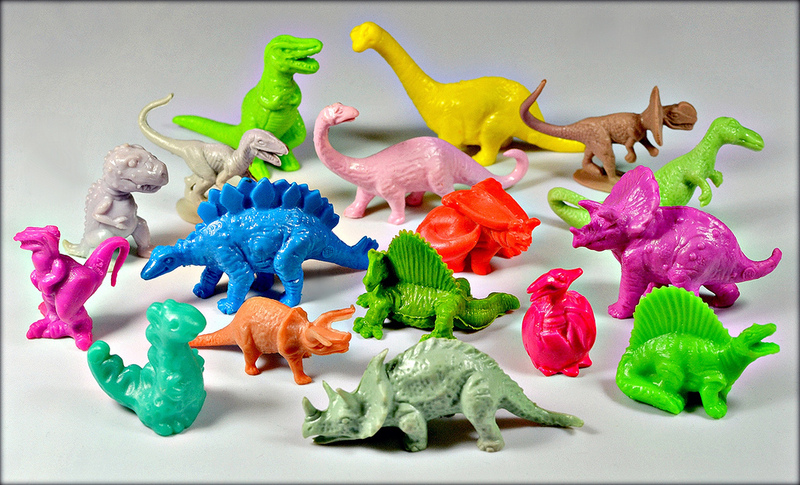 My favorite was always the Triceratops. It just looks so unique with those ridges going down its back and its oddly shaped face, working in the two sided mold by having one eye horn in front of the other. As a kid I thought that was really odd, but couldn't help liking it. Interesting--thanks. That makes sense as those two are made of the same material.